The reason for this encouragement, he explains, is the effectiveness of Vajrayana practice as a means to achieve accomplishment on the Buddhist path. Lama Jampa Thaye at Changlochen Ling, Dordogne, this summer when, over a period of two weeks, he bestowed a series of initiations of Tara.. There is no attempt in this blog to explain the Vajrayana, the path in which one puts into practice teachings contained in Lord Buddha’s Tantras. Here, we simply mention how ordinary people like ourselves can enter into this extraordinary path in an authentic manner and hence begin, over time, to realise its fruit in our own experience. The body of practices in Vajrayana cannot be explained in the same manner as the Sutra teachings. While a full understanding of the Sutra teachings can be obtained through the power of reason, Tantra operates at a more subtle and fundamental level. As such, its action is more immediate, carrying within it the fruit of the practice: enlightenment, buddhahood. It is thus called the ‘fruition vehicle’ in contrast to the ‘causal vehicle’ derived from the Sutras. How can we gain confidence that this is so and how can we enter into such a practice? To get to the point where we are ready to enter Vajrayana, we will have discovered that Buddha’s teachings are entirely grounded in the reality of our situation in the world. They bring us face to face with the facts of life and our connectedness with others - their suffering as well as our own. We can no longer seek to live in a bubble or on some mystical trip. The teachings are not spiritually romantic, but utterly realistic. So the Vajrayana, with its ritual and seemingly ethereal deities, is likely to seem strange in comparison to practices and teachings one may have encountered in the sutric, causal vehicle. This would certainly be very confusing were it not for the Lama who is able to put these extraordinary practices into the wider context of the entire path. Lama Jampa does this authentically and precisely, according to the Buddhist tradition. Having been given the authority to do so by his own Vajra Masters, the Lama opens the gateway to Vajrayana practice through initiations that have been transmitted in this way over many centuries. In his Way of Tibetan Buddhism, Lama Jampa explains that initiations are “essentially ritual embodiments of the transference of meditative realisation”. Any initiation must take place in person between a master and student or group of students. All subsequent deity-based practices in Vajrayana stem from initiations. It is through practice of a meditational text, or sadhana to use the Sanskrit term, that the student is able to cultivate the meditative accomplishment ‘planted as a seed’ at the time of the initiation. Hence, initiation is the only single gateway into Vajrayana practice. Lama Jampa always introduces Vajrayana in the context of wider teachings on the Bodhisattva Path and teachings that lead us towards that path. For, Vajrayana is only for those who have gone some way towards awakening the aspiration of bodhichitta. We readily see the sense, therefore, in the pattern of how the Lama appears to structure the days, weekends and other periods of his teachings. We invariably see his programmes to comprise of, firstly, a sutric dharma text - one that is derived from Sutras or commentaries on Sutras - followed by a Vajrayana initiation. The teaching Lama Jampa gave in Bristol in the autumn exemplified this pattern. In the morning he presented a quintessential Mahayana text composed by an early Sakya master, Nupa Rikzin Drak: ‘Instructions on Parting from the Four Attachments’ and in the afternoon, he bestowed the initiation of Chenrezik for the sadhana entitled ‘Mahakarunika and Mahamudra Unified’. In this way, in the morning, the focus was on why we need to practise dharma, what we need to practise and what the results of the practice will be. It surely could not have crossed anyone’s mind, listening to those teachings that morning, that there could be a more succinct and clear explanation of the “why” and the “how” of the dharma path. Whereas the morning’s experience was one of engagement on the level of reason regarding recognition of truths of in our lives, the initiation in the afternoon opened up another level of meeting the dharma, well beyond ordinary reasoning. It was just as well that we had already understood the essential groundedness of the Lama who was giving the initiation. From his teaching in the morning as well as from his initial remarks before the initiation, those present came to understand clearly the context and purpose of the practice to which the Lama was introducing us. This does not involve any kind of personal escape into a nirvanic state; for the purpose of the practice is to engender connection with and compassion for other beings. This is the Mahakarunika of the title of the sadhana: great compassion. The term Mahamudra refers to the awakening of the intrinsic buddha wisdom which is inseparable from compassion. Again, in London more recently, Lama Jampa followed his apparently customary pattern of teaching a Mahayana text, this time on mind training, in the morning and an initiation of Manjushri in the afternoon. Again and again, the Lama’s teaching helps us to see that compassion is not real compassion unless it is joined with wisdom. The morning’s mind training teachings showed the ‘why’ and the ‘how’ of placing others within our concern. The initiation of Manjusri that afternoon introduced us to Vajrayana practice that will help us to develop the wisdom that needs to be merged with our developing compassion. Through attending the Lama’s sutric teachings on these precious occasions we hear fresh insights into how we can further understand and develop our own dharma path. Through attending the initiations he bestows alongside those teachings, we can widen and deepen our understanding and practice of Vajrayana and, hence, of our dharma practice as a whole. Many of us find that the more we attend initiations, the more familiar we become with the kind of ritual that we are introduced to in each one. Familiarity of this kind is a great aid towards the sharpening of our focus during any given initiation. This was certainly the experience of many who were fortunate enough to attend the fortnight of initiations for the twenty one manifestations of Tara that Lama Jampa bestowed at Dechen’s centre in the Dordogne, France this summer. Look under Major Teaching Events on this website to find Lama Jampa's future programme of teachings at Dechen centres. Included in his 2019 programme are teachings on two texts by Gampopa, 4th patriarch of the Kagyu, which Lama Jampa began teaching this year: ‘The Jewel Ornament of Liberation’ and ‘The Precious Rosary of the Supreme Path’. Gampopa himself is famed for bringing together the Sutra and Tantra teachings, and his ‘Jewel Ornament’ sets out the entire path to buddhahood as a graduated path. Hence it is a seminal text applicable to dharma as practised across the various Tibetan schools of Buddhism. Recently Lama Jampa has been teaching the Mahayana mind training (Tibetan: lojong) at centres in the UK and America. For these particular teachings he has used a short text called The Eight Verses of Mind Training by the twelfth century master Geshe Langri Thangpa. Lama Jampa explained that the the mind training allows us, with our ordinary self clinging and self cherishing mind, to apply its methods in our meditation and everyday life situations, and so bring about a transformation within our own being. Ultimately, that transformation will lead us to full enlightenment, buddhahood with its qualities of wisdom and compassion. We can all take great encouragement from hearing through these teachings that, however ordinary or deficient in enlightenment we may feel right now, diligent application of the mind training will lead us to the goal of buddhahood. Lama Jampa showing that a sense of humour does help when it comes to practising the mind training. It can help us to lose our sense of self-importance. The essential method of the training is a very straightforward one for overturning our self-centredness, but our strong egos quickly find ways to duck and dive away from its unambiguous instructions. ‘Drive all blame into one’. This helps me to train myself to cease looking to others or to external factors as causes of whatever seems to be going wrong in my life; I alone must take responsibility for that. Lama Jampa explained that it is only those of us who have chosen to engage in the mind training who need to apply teachings on karma in this way. Anyone else’s karma is not an appropriate subject for our concern. The mind training is for our minds only! In answer to a student’s question on karma, Lama Jampa noted that ‘when the Buddha attained enlightenment, unhappily for us, we did not! Enlightenment arose just in his mind stream’. In other words, mind streams are individual and this explains why the practice is sometimes called a 'secret' practice, in the sense that one's practice is private to one's own mind stream. Hence, it is an attitude we adopt towards the world that places no demands on anything or anyone external to do the changing. It is our own business and there is no need to try to re-adjust the world around us. In fact, the converse is the case. We need to try and readjust ourselves to the world. We can do things like looking for positive qualities in others and cease to elevate ourselves as we normally do. . This is where other sentient beings come in - just as they are. Without needing them to change, we can take them into our practice. In this way, our mind training helps us actualise genuine love and compassion. Practising the mind training involves not just changing our mental attitude but also our behaviour; for example to soften our behaviour towards others. The practice is further deepened through specific meditation practices which we learn as we progress. A prerequisite for this is recognition in ourselves of disturbing emotions as they arise through the practice of mindfulness. If one were to ask what qualifications does one need to start with the Lojong? Lama Jampa put it very simply and not without a dash of wry humour. Just one's normal neurotic mind is all we need to bring to the practice. We don't need any great learning or even any great meditation power. In short, all we need to bring are our habits of self-clinging and self-cherishing; in short our neurotic way of relating to the world. We then find a way of transforming that through the practice. You can listen to this teaching via this link. Lama Jampa will continue his teaching on the text, The Eight Verses of Mind Training, in London later in the year. See the What’s On page on this website for details. How remarkable that a short text composed in Tibet some 750 years ago should carry such a recognisably authentic message of liberation in this age of social media. Of course, Jetsun Drakpa Gyalten’s ‘Song of the Eight Practices of Dreams’ goes far deeper than advising on how to deal with today’s world-wide monster, as Lama Jampa clearly showed us when he taught the the text last Saturday at London's Wetland Centre. For it shows how cunning and resourceful ego follows us all into our dharma lives - and, importantly, how to watch out for it so it doesn’t keep its hold. These days it seems, especially in the Twittersphere, that we have to have an opinion about everything - about every little thing and every big thing that happens. And we have to come out on the side of the good guys or else we’re seen not to care. As Lama Jampa says in ‘Wisdom in Exile’, it seems like it’s the age of compassion now. The key is to check out which team, which tribe, to support as being on the side of good and revile the other. What does Jetsun Drakpa’s teaching say about this? What does Lama Jampa himself actually say about this? Explaining the Jetsun’s advice, Lama Jampa simplified the whole business for us last Saturday. One of the song’s liberating messages is that if we develop pride in our own side as being right, as being the side of the ‘good ones’ and if at the same time we are trying to practise the dharma, then we are making a mistake. Realising this frees us up to have compassion for both sides and all sides. We can be totally free with regard to our dispensation of compassion. The Lama even put it like this, in answer to a question: “We are promiscuous in our compassion. It’s not us versus them. Not goodies versus baddies”. So truly freeing our hearts. In the afternoon, Lama Jampa gave an initiation that enables us to cultivate meditation on the principal bodhisattvas of the three Buddha families: Manjushri of Vairocana’s Tathagata family, Chenrezik of Amitabha’s Lotus family and Vajrapani of Akshobya’s Vajra family. This is very special as it provides a way to cultivate the three innate qualities that we need to sustain us on the path: wisdom, compassion and power. Those of us who have embarked on this mode of meditation can see that such practice actually does help to turn us around in our hearts. Rather than seeing the kind of teachings we heard in the morning as an onerous giving up of what we really want to do, we gain a freer way into a lighter compassion which doesn’t need to carry a heavy heart. Buddhist Deities - What on Earth Could They Be? A general point about the dharma is that no dharma teaching can be taken in isolation. Its meaning and how we are to understand it and how to practise it, no matter what teaching it is, is only really revealed to us - only becomes clear to us - when we see it in its context. Any teaching taken out of context can actually end up being subverted leading to confusion rather than to wisdom and compassion. So the vajrayana cannot possibly be understood - its intention, what its function is, what meaning its teaching signify - unless we see it within the context of the earlier teachings. For example, something we talk a lot about in vajrayana is ‘deities’. Well, what on earth could they be? Actually, from a dharma point of view they are, in a way, nothing at all: emptiness, which is the true nature of all phenomena. Not knowing that, one could easily mistake talk of deities as referring to some external beings or some creator god or supreme rulers of the universe; the familiar idea we have from previous religions. Deity is, in fact, simply a term for the sacredness of the nature of ultimate reality - a sacredness which is there because all things are empty of any abiding nature. So, we see that the term deity must be understood from a thoroughly buddhist, non-theistic, point of view if we are to begin to understand what is being talked about. Your Dechen blogger transcribed the above, word for word, from a teaching given by Lama Jampa in Bristol on Saturday 30th September. Why keep the teachings unaltered? Why give ‘lungs’? A central topic of Lama Jampa’s teaching in Manchester last weekend was the buddha nature. This is a topic, when taught with subtle precision and fidelity, from which we can gain confidence and faith in dharma and in our own ability to practise it. The Lama explained that he believes the teachings should be maintained exactly as they have been passed down from teacher to student over the centuries. How else could we have any confidence that they could work for us, as they have done for our Lama and all those masters and practitioners who came before him? Hearing the teachings this weekend, it was clear that the instructions for meditation, and the explanation of how those instructions take effect, are very precise as well as being very subtle. They are also particular to the system being set out in this text and should not be mixed with other systems to be found in other texts. It is their very precision and particularity, as the Lama said, that provides the reason to keep to the traditional Buddhist procedure of giving the reading transmission [Tib: lung] of each original text, as well as line by line translation of its content. In his presentation of the teachings, the Lama does provide some additional explanation of the lines in the text but this is only to highlight the meaning. As Lama Jampa himself explained, trying to study the teachings without having received the lung means we have not received their blessing, which comes through their authentic transmission. To study dharma texts in this way is worthless and may even be harmful. All of this means that we have been given the same teachings that Lama Jampa himself has received and studied and meditated on. In this way, as a westerner like ourselves, he gives us a perfect example of where these teachings lead when they remain unaltered and undistorted. This is how he himself received the teachings - so why would he cheat us and give us something different? After all, one thing we can see is that the teachings received in their original form have worked for Lama Jampa. Simply hearing the teachings once or reading them through afterwards or trying to practise them without further guidance is not sufficient for us to develop realisation. We have to work with them in a step by step manner in consultation with the Lama, for he himself has gone through the process of facing all the challenges that the teachings throw up and therefore can help us to deal with such challenges as they crop up for us, as they surely will. Reading Lama Jampa’s new book Wisdom in Exile and hearing him introduce it at its recent launch in London, it is clear that his knowledge and understanding of European religious and intellectual traditions and his ability to talk about these far outshines those of the vast majority of us. It would have been easy for him to combine the two streams of western thought and Buddhism into a new and superficially appealing ‘Buddhism for westerners’. However, as he argues in Wisdom in Exile, all such attempts to do this - and he points to several unfortunate examples - will only lead to corrupt forms of dharma that quickly lose their the power to transform our self-centredness and lead us to liberation. From all this, we can see why discerning students want to receive teachings that have remained unaltered from their original form. The approach followed by our teacher, Lama Jampa Thaye, is understood by his students as being the most authentic and reliable. That is why we ask him to give us reading transmissions and line by line explanations of texts. In any case, he has made it perfectly clear he has no intention of doing otherwise! Lama Jampa will be visiting Kagyu Ling at the end of July to give the reading transmission (lung) for the Kagyu Ngondro (Preliminary Practices) and its commentary The Torch Of Certainty by Jamgon Kongtrul. The lung will be given over two evenings, 31st July and 1st August. It is most auspicious that in the three months since our new centre in London for Sakya Dechen Ling opened, three of our Lamas, including the head of our tradition His Holiness Sakya Trizin, have visited to bestow their blessings upon it. You will often see posts on this and other Dechen related blogs mentioning that students have travelled miles to hear the Lama teach. This spring in the UK, people have travelled to Bristol, Manchester, London and Harrogate (follow the blog post links to see accounts of the teaching events in those places). Why do students travel so far and so often to hear Lama Jampa teach for what can be quite short periods of time? They even sometimes go to hear teachings they have heard before! The answer is that there is more to going to a Dharma teaching than simply sitting in a nice hall with our friends, letting inspiring words float into our ears – and, quite possibly, straight out again! Hearing the teachings is just the first step. It is not about feeling moved or uplifted for an hour or two, it is about receiving something that we can keep, some instruction or explanation that we can bring back home with us and work with. Dharma is like food, it is meant to be chewed over and digested, not like some cooking wizardry watched on TV but never tried out and tasted in our own kitchen. This is the second step - what we do after we have got back home with what we have heard: thinking about and reflecting on the teachings; going over them in our mind, relating them to our life and meditation experience. That is how we digest the teachings, take them into ourselves and make them our own. Receiving the teachings is the start of something much more serious and lasting than simply going on a Dharma day-trip. It is the start of the threefold process of hearing, thinking and meditating. That is why people take notes at Lama Jampa’s teachings, so that later they can study and reflect on them and put them into practice in their lives. Even if we hear the same teaching again or even several times, we always find something new in it, some fresh insight or stronger appreciation; not because the Lama has changed the teaching or added something new to it but because we didn’t fully grasp it the first or even the second time around. Returning to the teachings again and again, whether by hearing them in person from the Lama or by turning back to notes, taken perhaps months or years before, will always enhance and deepen our understanding. Travelling to the teachings is, of course, nothing new. Tibetans like the founding masters of Kagyu and Sakya undertook perilous journeys to find Indian gurus, so they could bring the Buddha’s teachings back to their homeland. Our own willingness to travel to hear the Dharma, whether in this country or abroad, is in a very small way an emulation of the great example set by the forefathers of our Dharma tradition. There are threads of teaching that Lama Jampa is giving at each of his Dechen centres in UK, France, Germany, USA and Mexico and which students are following. 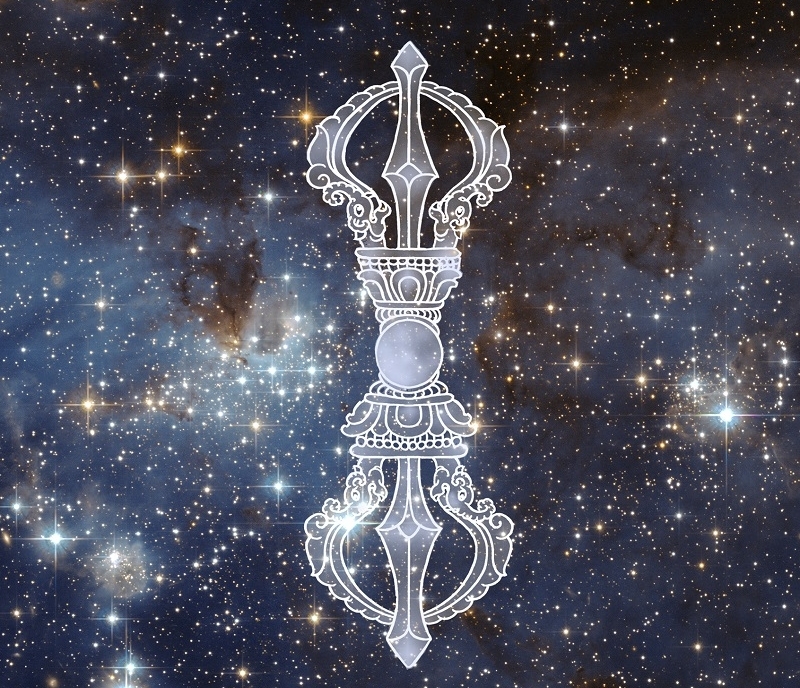 The current thread for those attending the shedra teachings in Manchester is a nineteenth century Tibetan text called “The Rays of the Immaculate Vajra Moon” and we are studying and reflecting on the teachings given so far with keen anticipation of what will come next in the teachings in July to further clarify, in this case, what is real and what is not. Many also travel south to Bristol and London to hear the Lama teach chapters from his text, “Rain of Clarity” and between teaching sessions form study groups to help establish a better understanding of what has been taught. Even if we have missed earlier parts of any of the ‘threads’, we can still join up with them. Lama Jampa always begins each session by giving a summary of what has gone before and putting what is to come into context. It is never too late to get on board and begin the life-changing process of hearing the Dharma so we can bring it back home to enrich our life and our Dharma practice. Lama Jampa himself explains the threefold process of hearing, thinking and meditating in this YouTube video. 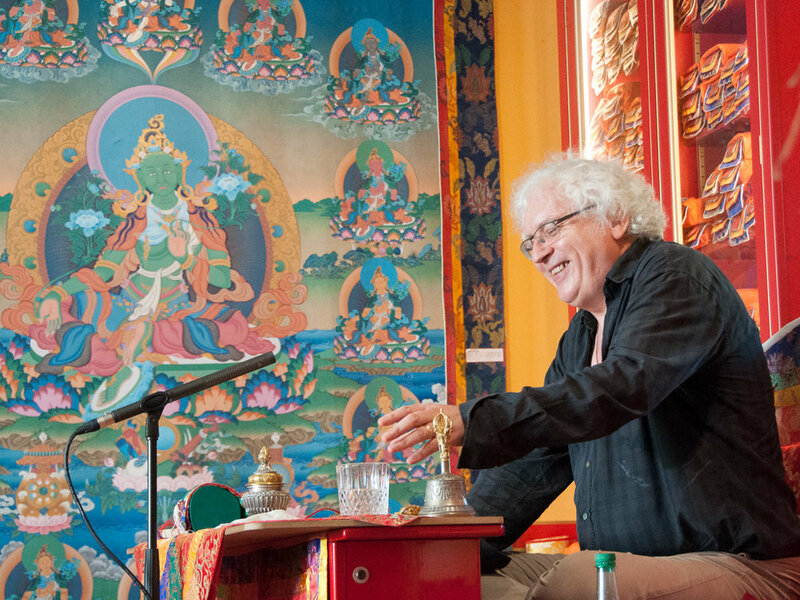 Lama Jampa recently gave a talk in Stuttgart entitled ‘Death and Dying from a Buddhist Perspective’ and a recording of this talk can be found on SoundCloud here. This post provides a brief synopsis of the Lama's talk using much of his own introduction to the topic. “Learning how to live properly we need to learn how to die properly. In Buddhism, life and death are seen as twin faces of reality. “In the modern world the sight and significance of death have been put out of view and we have come to see it as a fading away into nothingness or an abrogation of everything wondrous about life. That leads to embarrassment or fear about the subject as well as other emotions. This not only impoverishes our lives but is a foolish move, since we all will come to know death in the most intimate of ways. “What Buddha discovered on the night of enlightenment was the state beyond birth and death, the clear light, unborn and unceasing, which is the fundamental nature of our mind. To experience this freedom from birth and death, we need to learn to pass through the gates of death. The technical term for this space is bardo (intermediate state) and, in his talk, Lama Jampa goes on to describe what are known as the three bardos: the bardo of life, the bardo of death and the bardo of dream. It is possible to recognise the fundamental nature of our mind, the clear light, in each of these bardos. Hence it is possible to attain the deathless state in this life and great masters have done so throughout the history of the Buddhist tradition. It is clearly difficult for us to awaken from the bewitchment of self into which we have fallen in this physical life but, as Lama Jampa explains, at the time of death, when the sense of physical identity dissolves, there is greater opportunity to recognise the deathless state. We can prepare for that opportunity simply by the practice we do in this life and by knowing about the intermediate states. Lama Jampa emphasises that preparing for the bardo of death is the most natural thing in the world and not some extraordinary or esoteric excursion. In this, we are returning to the fundamental, simple state, the actual nature of mind as it really is. In his talk, Lama Jampa delineates the processes of dissolution in some detail, including how, as explained in the Tantras, each of the dissolutions results in a kind of hallucination. Having described these bardo experiences, Lama Jampa then explains how the process of rebirth occurs. This happens through the force of karmic imprints, through which one’s consciousness is impelled forward into the ‘next life’ - which, in the case of a human birth, is into union with the unifying male and female elements, the sperm and the ovum. In summary, the Lama says that in his talk he has tried to highlight the parallels with our own experience in this life to show that the bardo, the intermediate state, is just an encounter with the true nature of reality, which is always there between each thought, between one moment and the next, between one emotion and the next. The bardo is always there.